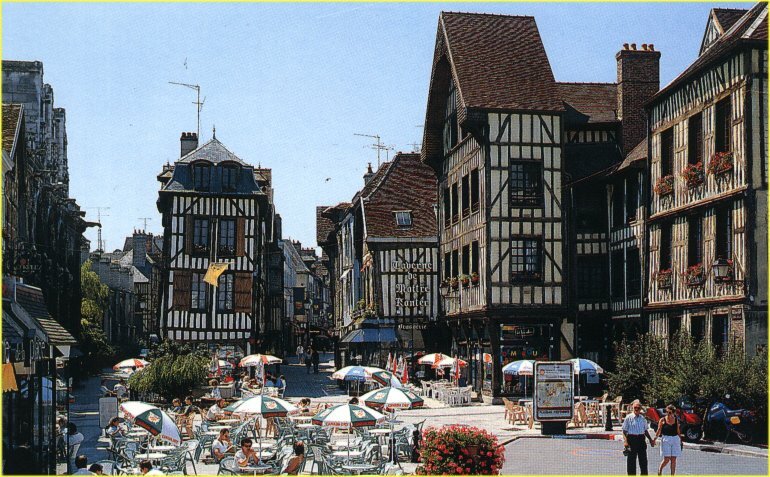 I lived in this small French city for most of my stay in Europe. Our group stayed in Dorms on the Campus of the University and it was a 30 minute walk to the old city center which has some of the most beautiful architecture I've seen. The timber framed housing dates back to the 15th century hasn't changed since. The people are very nice and I'm sure they had their laughs when I tried to speak French and when I bought a kilo (2-1/2 pounds, a little bit more than I intended to get) of tomatoes the first day I arrived. The transportation system is very good with bus routes all through the town. The stops even have displays showing how long the next bus will be. They do stop running around 6:30pm so If your going downtown at night plan on walking home. I probably spent about a week and a half in Paris when I add up all the weekends and Day trips we took there and I'm proud to say we took every metro line in the City and hit up just about every major attraction the city had to offer. From the Catacombs 1000 feet below (lots of spiral stairs) to the top of the Eifel Tower (thankfully they had an elevator). Paris is a great city and it is definitely a must see. With the Study Abroad program over my friend Allison and I were ready to start our trip across Western Europe. Our first train ride was supposed to take us to Rome but we missed it because we misread the time the train was leaving (20:00 does not mean 10PM). So we took the next train and ended up in Bern. What a great mistake that turned out to be. The city was surrounded by the Aare river on three sides and the foothills of the Alps. Bern is definetely on the top of my list of places to visit next time I travel to Europe. The land of sausages and beer definetely lived up to it's reputation. We stayed in a really nice youth hostel with a bar and 2-euro beers. Dachau, the concentration camp, is definetely a place everyone (and I mean every single person alive) should go to see the atrocities committed there and hopefully learn enough from the past to never let it happen again. On a ligher note, the Haufsbrauhaus definetely had the largest mugs I've drank out of (more like pitchers). I got yelled at by a bunch of Germans for jaywalking which I learned is very frowned upon. Something must have had a lasting impact on me when I was there because I'm planning on studying abroad there for a full year there in a couple of years. This was the last stop on our little European Adventure and we couldn't have picked a better choice. I rented a bicycle and just rode around the city getting lost but not caring. We went to the Heineken museum (for educational purposes ofcourse) and the Van Gogh gallery then took a cruise through the canals. We had a terrific breakfast at a pancake house, chocolate chip pancake with strawberries, bananas, whip cream and even more chocolate syrup on top, mmmm. On my last day in Europe I woke at 5am to see the Sun rising over the skyline of Amsterdam. Not wanting to wake my companions I wrote a goodbye note and left quietly. I walked to the train station and began the long journey home. I had a lot of time to think on the trains, cabs, and planes. I reflected on all the good times and realized that I had made some true friends and to this day I beleive I am a better person because of the time I spent abroad.